As soon as we hit November, I start to think about Christmas. The time just seems to whiz by and I find it is the time to start getting organised and start getting excited. How about you? Do you find that you’re the one organising the presents for everyone else? Why not get something nice for yourself?…..and the bonus is that it comes with a free gift. Read on for more details….. Promotion Details: Get a FREE Festive Paper-Piercing Pack when you purchase the Ornament Keepsakes Set and Candlelight Christmas Specialty Designer Series Paper Bundle. Are you wondering what the Ornament Keepsakes Bundle is? Check out the front cover of the Holiday Catalogue- Yes! Yes! That beautiful ornament on the cover has been created using the Ornament Keepsakes Stamp set and the matching framelits dies. Festive Paper Piercing Pack- FREE when you purchase the bundle. Here’s a close up of the ornament featuring the ‘faux metal technique’ that was taught at a recent class. If you’ve not see the Summer Mini Catalogue OR the Sale-a-bration brochure- I can only strongly urge you to check them out some time in the next 10 days or so. In LESS than two weeks the FREE sale-a-bration items will no longer be available. Also the Summer Mini catalogue finishes on the 31st of March and a lot of the items in that catalogue may never be available again. Please click on the links in the side bar to view each of these catalogues. Today’s card showcases the FREE sale-a-bration paper called “Everyday Enchantment” and also a stamp set called “You are loved” (on page 12 ) from the Summer Mini Catalogue. I just LOVE LOVE LOVE the way Stampin’ Up products co-ordinate. Did you notice that the flower I stamped in the card above (from the “You are loved” stamp set) matches some of the Everyday Enchantment patterned paper? Other pieces of the patterned paper- (not featured in my card above) also match the flowers in the sale-abration stamp set called “Fresh Vintage“. Other sheets match images from the “Elementary Elegance” Stamp set. It makes working with the products “Oh so easy” It is definitely worth popping in a qualifying order so that you can receive some of these free items. For every $100 spent on merchandise- you can select a FREE Sale-a-bration item. Please get in touch with me via E-mail or phone and I would be more than happy to help you out! I’ve used the same stamp set as I did for the card yesterday but this card has a totally different look. ………and with a quick change of a stamp and a sentiment the “Thank you” card becomes a “Happy Birthday” card. If you’re going to sit down and make one card- you may as well make two! Right!? Dress up Christmas promotion- FREE RIBBON! 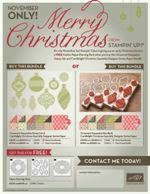 Between now and the end of November Stampin’ Up have a great Christmas promotion where you can receive FREE ribbon. I love the look of ribbons on cards but it is also great to use the ribbon to create beautiful packaging to fit any Christmas gift! So how can you receive your FREE ribbon!? The Bundles and ribbons are available only while supplies last. Please be sure to get in touch with me to book your workshop or to place your order for a “christmas bundle” and receive your free ribbon!